Membership of the Institution offers stepping stones on a career path - from student to Chartered status, attracting professionals of high standing with significant specialist and interdisciplinary experience. The Institution is an international organisation with members in Australia, Bahrain, Belgium, Canada, Hong Kong, Ireland, Kenya, Malta, New Zealand, Nigeria, Norway, Oman, Portugal, Rwanda, Singapore, South Africa, Switzerland, Thailand, United Arab Emirates, USA and Zimbabwe. To promote the role of environmental sciences and sustainable development in higher education, the workplace, the professions and society at large. To promote inter-professional practice for environmental science and sustainable development professionals through the application of interdisciplinary and systems thinking. To develop high professional standards, competencies and ethics for environmental professionals through the publication of guidance, accreditation of qualifying courses and through continuous professional development. To promote the environmental sciences and sustainable development in careers education and guidance. To disseminate appropriate and timely information and opinion for the benefit of members and society at large. To provide professional and learned advice on environmental sciences and sustainable development. As part of the IES' 40th year celebrations, the IES dug into its archive and crunched some numbers relating to our history. 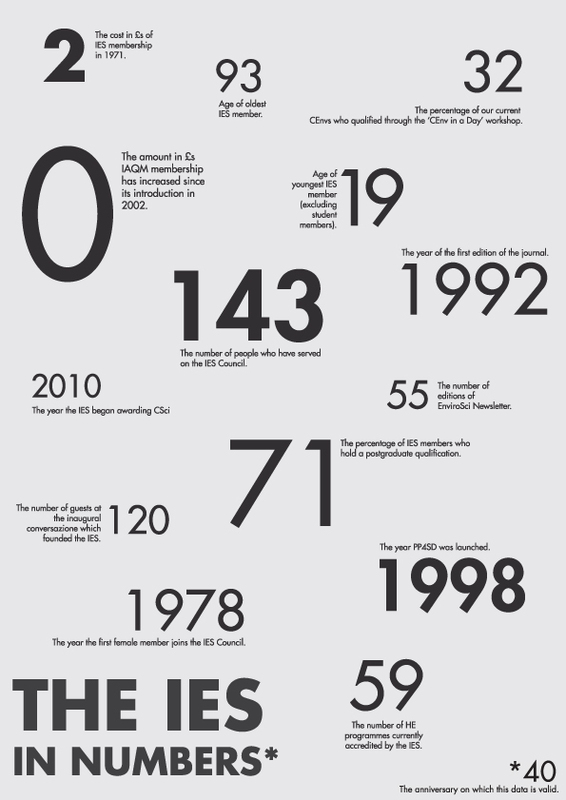 Charting forty years of the IES' history. Having trouble reading the timeline below? Explore it in greater detail here. The IES believes that a scientific approach deepens our understanding of the natural environment and sustainable development. The professions have a vital role in the transition to a sustainable society and it is absolutely essential that this transition is underpinned by sound science. The IES seeks to lead debate, dissemination and promotion of environmental science and sustainability. We promote an evidence-based approach to decision and policy making and are devoted to championing the crucial role of environmental science in ensuring the well-being of humanity now, and in the future. In upholding the standards and importance of the profession, we not only act as an advocate for environmental science, but as a catalyst for improvement. We provide an inspirational vision for the profession as a whole, and the strategic direction to implement this. Committed to excellence, the IES exists to serve its members and the public, and through innovation aspires to distinction in the services it provides.